Yes, Colorado lawmakers, it’s still important to deal with a projected budgetary crunch triggered by future tax refunds even if they are no longer likely in the next fiscal year. The problem is only being delayed for one year. Refunds will almost certainly be required in the following years under the Taxpayer’s Bill of Rights unless the economy entirely tanks. And yet they will come at the expense of critical transportation, capital maintenance and education funding. Indeed, transportation funding is already slated to decline in next year’s budget. In other words, lawmakers still have urgent reason this session to reclassify the hospital provider fee into a separate “enterprise fund” to allow the state to remain below TABOR revenue limits without refunding money. 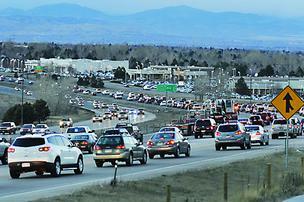 Overcrowded highways like this stretch of C-470 near Yosemite would be a primary beneficiary of the hospital-provider fee bill, business leaders argue. Colorado business leaders charged into the state Capitol Tuesday to advocate for a newly introduced change in the hospital provider fee that they believe will increase funding for transportation and education — and ran right into a key Republican legislator who questioned whether they would be taking revenues illegally from companies and individuals that need them more. House Speaker Dickey Lee Hullinghorst’s long-planned bill to pull some $700 million out from under the Taxpayer’s Bill of Rights (TABOR) revenue cap and turn it into an enterprise fund received its first hearing in the House Appropriations Committee Tuesday, one day after it was introduced. Committee Democrats passed it onto the House floor over the objections of Republicans, the first of several steps in what is expected to be a weeks-long fight over one of the most watched measures of this legislative session. The seven-year-old provider fee charges hospitals for each night a bed is occupied, leverages that money to get an equal amount of federal matching funds and expands the eligibility of childless adults for Medicaid, reducing the burden of uncompensated care on hospitals. By turning the fee into an enterprise, it frees a lot more room for the state to collect new revenues without reaching its TABOR cap and having to give back any excess money as tax refunds. State lawmakers introduced a bill Monday that would eliminate tax refunds and give the state more money to spend.Colorado is collecting so much money that it has to send some of it back to residents, as required by the Taxpayer’s Bill of Rights. But Democrats say there’s a big pot of money in the state budget that shouldn’t count toward the TABOR limit. It’s a fee hospitals pay that the state spends on expanding health coverage for the poor. The new bill changes how the state accounts for this fee, making it exempt from TABOR. That would effectively allow the state to hold onto hundreds of millions of dollars it would otherwise have to pay out in tax rebates. A separate measure, which would only apply to next year, directs lawmakers to spend the extra money on transportation, local governments, and schools. The fee-change bill has bipartisan sponsorship. Sen. Larry Crowder, a Republican, says the change could help rural hospitals in his southeastern district. However the Republicans who control the state Senate strongly oppose the reclassification, calling it an end-run around TABOR. House Speaker Dickie Lee Hullinghorst said she tried to work with Senate leaders. DENVER – The speaker of the Colorado House said negotiations have reached a “stalemate” on a long-debated and highly anticipated proposal to retain more state revenue through an accounting change that would eliminate TABOR refunds in future years. – HB16-1420 creates the Colorado Healthcare Affordability and Sustainability Enterprise (CHASE) to administer a new hospital support program as a state enterprise. – HB16-1421 spends the revenue the state would be able to retain through CHASE on a variety of different programs like transportation and education. The prospects for the bills Speaker Dickey Lee Hullinghorst introduced Monday are poor in the Republican-dominated Senate. One of the bills reauthorizes a fee charged on hospital stays so that millions of dollars go into an enterprise fund that is exempt from the spending limits in the Taxpayer’s Bill of Rights. The other bill spends the revenue the state would retain if the first bill passes. Colorado House Speaker Dickey Lee Hullinghorst introduced her anticipated bill to turn the hospital provider fee into an enterprise fund Monday with two twists — a Republican sponsor in the Senate and a companion bill allocating general-fund money that would be freed up if the bill were to pass. Created in 2009, the fee is assessed on hospitals for each night that a bed is filled with a patient, and the revenue is used to receive match funding from the federal government and to increase Medicaid eligibility for childless adults. 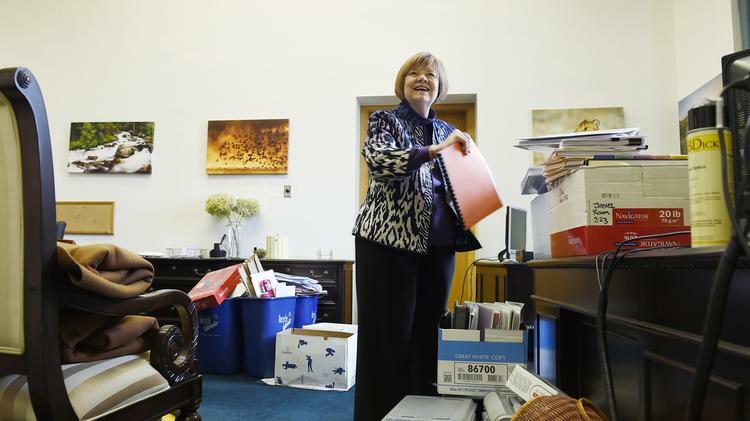 House Speaker-designee Dickey Lee Hullinghorst unpacking in her new office at the capitol. In 2009, the Democrats controlling Colorado state government wanted more money. Among other things, they wanted to expand Medicaid. They needed to increase state revenues. Their problem was that the Colorado Constitution requires a vote on new state taxes and the U.S. was in the depths of a severe economic downturn. State officials knew that a new tax would never be approved by a popular vote. To get around both the letter and the spirit of their constitutional duty, they simply labeled the provider tax a “fee” and imposed it. Fees do not require a vote. Today that tax badly disguised as a fee is raising $688 million in additional revenues that is counted towards the total amount of tax revenue that the state is allowed to keep under the Colorado’s Taxpayer Bill of Rights (TABOR). Facing a money crunch, Colorado lawmakers resorted to extraordinary feats to craft a $27 billion budget bill Thursday, eliminating a $59 million taxpayer refund, slashing $73 million of payments to hospitals and cutting $50 million for road construction. Even then, budget writers needed to pull millions from other cash accounts and tap reserves to balance the spending plan for the fiscal year that begins July 1. But the moves prevented even deeper spending cuts to classrooms, college campuses and health care providers that Gov. John Hickenlooper proposed in his budget plan. DENVER — State revenues have dropped off a bit, enough that it could prevent an automatic refund under the Taxpayer’s Bill of Rights, state economists told lawmakers on Friday. Projections for the next fiscal year are expected to be down by about $111 million, meaning the state likely won’t reach the revenue cap that automatically triggers a refund under TABOR as had been expected from the last forecast in December, the Colorado Legislature’s chief economist, Natalie Mullis, told members of the Joint Budget Committee.